Google has this built in feature to compute equations directly on the search box of Google homepage, which is something like a built in intelligence and on the fly computational power (search and understand the searched string). A simple example is , if you are asking someone "Do you know the time ?" a computer/robot will answer "Yes" but a human would answer "Yes. Its 2:30 pm". More than just Question & Answer format. Similarly Google search engine is smart ... if you type "time" and search, it will return the first result as the time of your location followed by all search results for the word time. 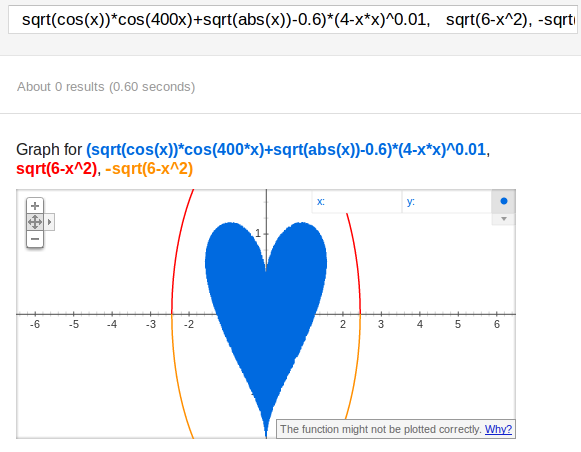 Now the reality is, someone really smart has designed this equation but its floating on the internet as, Google Love ,Google Heart for this Valentine's day, Send a Google search query to your Sweetheart, heart equation of Google, Gift your Valentine a search query. But my question is "can we find out who was the first person to post this equation on the internet ? Well only Google or any other search engine might know this. However twitter user Huckberry did tweet about this equation long time back. Suddenly people have started playing around this equation to try different combinations to create objects like "A teddy bear holding some Chocolates " , "A Red Rose" and many more. The craze will surely continue even after valentine's day for may other such occasions.Well done Google. Thanks Amit.